So here’s what happens when you’ve been planning to do an upgrade for like, I don’t know–let’s just say, maybe like–twenty five years? Like literally since you bought the house that you walked into and it took your heart into it’s wood floors and interconnected rooms that made you feel like a child. The house that has windows that speak to you in tongues. Those windows that refract the light that streaks across those shiny wood floors that have been dulled over years of the tredding of sneakers and boots and paws and slippers and cleats and high heels and loafers. The house that you moved into and told The Spouse that this was your final resting ground. Like throw my corpse in the backyard when I die resting. The house with the unacceptable kitchen that you ended up cooking for seventy revelers–actually between 55 and 100–for the past twenty five Christmases. The kitchen with the stove that your Dad saw when he met his four-week-old, Big Guy grandson and immediately took you to Sears to replace the 1940s stove. Really it looked super retro-cool, but was a disaster for cooking. And those few forties cabinets that you impossibly stuffed your goods in. But the door to that great back deck! And now, we’re going to do that modernization thing. Including that bathroom. There is just that one. The one that was clearly very cheaply revamped to sell the house. You knew that when you saw the wallpaper trim tacked onto the subway tile that surrounded the tiny vanity with the door that you couldn’t open fully because the toilet bowl was an obstruction. Yes. That one. The house that I love. And, now, I am crossing my fingers and making the sign of the cross and maybe lighting candles with herbal essenses that are healing, so that the tub fixtures will allow us to take the number of showers we need until–well, until we move to the interim space. Frankly, I know we are on borrowed time. Both the hot water and the cold water faucets are stripped. This is pretty recent–like two weeks. So there’s the most awesome pliers that we are using to deliver and adjust the water for showers. It rests on the edge of the tub, in case someone needs to adjust the water temperature. Actually, in order to get the water flowing. Currently, it’s just that essential. 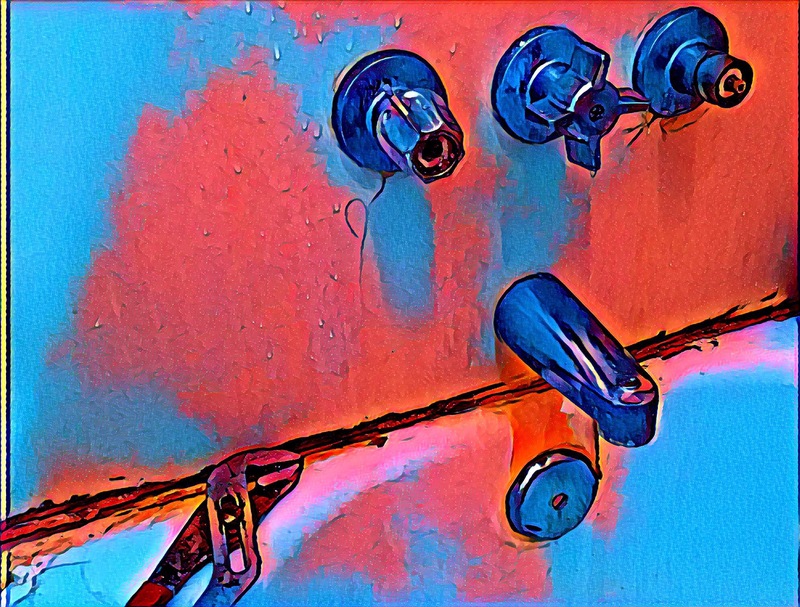 When you’ve been planning to gut the bathroom for twenty-five years, and you are close to doing it, you just don’t want to invest in a new tub faucet system. Especially because you are living in a dream world. Where the tub is on the other wall. And there is room for your legs when you are doing your morning constitution. And then, you look at the plans and realize that everything will be somewhere else. But not today. Not, yet. Pray for showers. Just need a few more months. Just. A. Few. More.